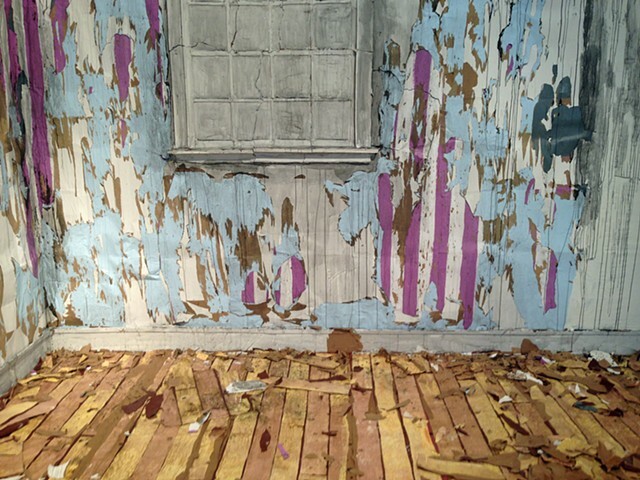 Hegartys installation Parents Bedroom (Torrance Art Museum 2015) is based on the color scheme of her parents bedroom when she was young, which included purple striped wallpaper that was eventually stripped and repainted to be powder blue. Hegarty created the installation by first pasting layers of painted paper to the gallery walls and floor and then peeling back the layers to create an effect of a decaying and/or abandoned space. Parents Bedroom is a meditation on memory, space and personal history. Hegarty's recreation of her parents room captures the vanishing memories of her childhood, translating feelings of remembrance and loss into extant reality. This is the third and final installation of the work at The Torrance Art Museum. Hegarty made the work in 2014 when it was initially installed at Friedman Benda Gallery in New York City for a group show titled Aprocryphal Times. In January 2015 it was reinstalled at The Korn Gallery at Drew University in Madison, NJ. The work gets more fragmented and fragile with each reconfiguration and will be discarded after the end of this show.